The MIP10 platform offers highly integrated MPL Industrial PCs on a footprint smaller than two credit cards. Designed for fanless operation, powerful, robust, and based on the Intel Centrino Mobile Technology. It incorporates different low power embedded Celeron-M and Pentium-M processors. On-board integrated is next to numerous standard features, SATA, ECC RAM and Gigabit Ethernet. The MIP10 platform represents a ideal solution for today's demanding industrial needs and x86 upgrades. The products are easy expandable over PC/104 or PC/104-Plus. The MIP10 platform is designed from scratch to operate under extreme and normal conditions without the need of fans or derating and throttling. The boards are rugged enough to be used in any application. These features make the MIP10 platform the ideal solution for any application where a high performance PC with low power consumption and long term availability is required. The MIP10 boards are used in vision, medicine, transportation systems, telecom, as well as in any industrial application. 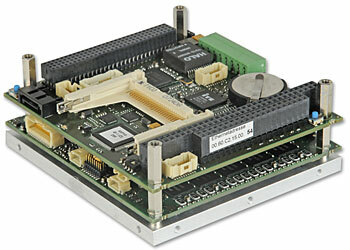 Because of its size the boards are ideal to upgrade existing x86 PC/104 boards. Ethernet 10BaseT /100BaseTX / 1000BaseTX On ESD protected, lockable header, auto neg. • GigE and switch modules 100% PC/AT compatible and can be operated with DOS, Windows, QNX or any other PC compatible operating system. MIP11 Design-in Kit consisting of MIP11-1 mounted on desktop cooling plate, inc. all interface cables and external ATX power supply. Additional accessories like SDRAM module, HDD, CF and OS are not included. Ready for operation. MIP10 Design-in Kit consisting of MIP10-1 mounted on desktop cooling plate, inc. all interface cables and external ATX power supply. Additional accessories like SDRAM module, HDD, CF and OS are not included. Ready for operation. MIP9 Design-in Kit consisting of MIP9-1 mounted on desktop cooling plate, inc. all interface cables and external ATX power supply. Additional accessories like SDRAM module, HDD, CF and OS are not included. Ready for operation. 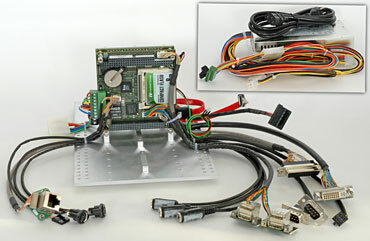 MIP8 Design-in Kit consisting of MIP8-1 mounted on desktop cooling plate, inc. all interface cables and external ATX power supply. Additional accessories like SDRAM module, HDD, CF and OS are not included. Ready for operation. For deployment in harsh environments, the MIP10 can be ordered in an extended temperature version. Every system needs to pass various tests in a climate chamber to prove that it will perform flawless over the temperature range indicated. see also MIP Family Options for additional add-ons and extensions.